However, educational attainment and participation rates across Afghanistan remain severely depressed. The estimated adult literacy rate of the country as of 2015 is 38 percent – significantly below that of both the international average of 84 percent, and of neighboring countries such as Pakistan (56 percent) and Iran (87 percent). Participation rates in basic and secondary education are also startlingly low. In 2015, the Netherlands organization for international cooperation in higher education, NUFFIC, reported that “less than a quarter of the pupils complete the first 9 years of education while less than 10 percent pursue education until [grade] 12.” Gender inequality also remains a deeply entrenched problem. Teacher qualifications and outmoded teaching styles and materials represent ongoing challenges as well, with many teachers lacking any formal training, and many textbooks badly outdated. Endemic at the primary and secondary levels, such problems also exist at the tertiary level . In other words, in a country where 41.8 percent of the population is under 15 years of age, education quality, equity, and access remain urgent national development concerns. Afghanistan reportedly has 15,249 general-education (government) schools… and almost 8.7 million students enrolled. The number of enrolled students is the sum of present and absent students. The [Afghan Ministry of Education (MOE)] counts students who have been absent for up to three years as enrolled because it says they might return to school. The MOE acknowledged a large number of children are out of school, but is unaware of how many, who or where they are, or their backgrounds. 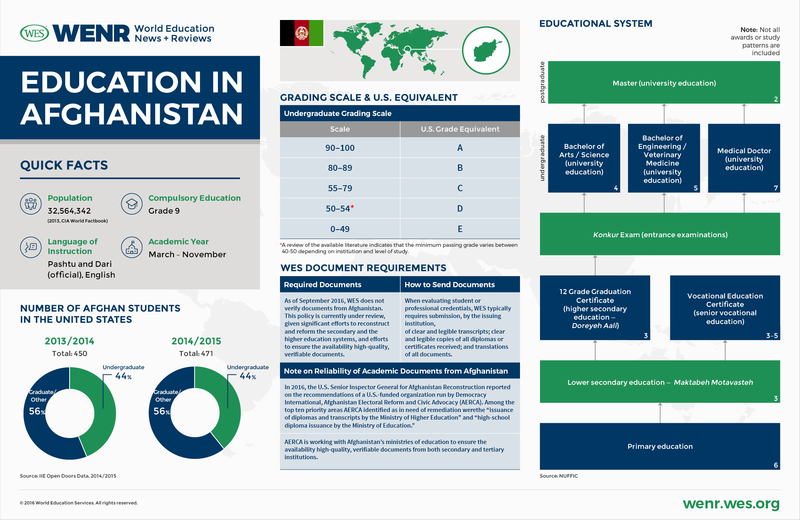 Barriers to data collection in Afghanistan have resulted in imprecise and inaccurate Education Management Information System (EMIS) statistical data. School administrators are not always instructed on how to fill out EMIS forms, and EMIS officials don’t have the staff or resources for data verification, and are impeded by lack of security around the country. In other words, education data coming through official Afghan channels should likely be read through a buyer-beware lens. Estimates of the number of outbound students from Afghanistan differ by source, with the World Bank calculating in 2013 that some 5,000 Afghan students studied abroad. As of 2016, UNESCO reports that approximately 17,000 Afghan students studied abroad in 2013, with 9,033 (53 percent) in Iran, 2,330 (14 percent) in India, 1,310 (8 eight percent) in Turkey, 1,226 (seven percent) in Saudi Arabia, and 428 (three percent) in the United States. Outbound mobility to the U.S. has remained relatively static over time: IIE data show that from academic year 2010/11 to 2014/2015, the number of Afghan students in the U.S. increased by only 10 percent. Financial considerations are likely one factor at play: Given Afghanistan’s $1,933 GDP per capita income, even the cheapest U.S. college education is an extremely expensive option for Afghan students. The Afghan education system includes primary education, secondary education, higher education, vocational education, teacher training, and religious education. The Education Law of 2008 mandates nine years of compulsory education (primary education and lower secondary education). Free education through the bachelor’s level is a constitutional right in Afghanistan. However, capacity is lacking in public institutions, and in the last decade or more, dozens of for-fee private institutions, most of them also for-profit, have sprung up to absorb young Afghani’s growing demand for higher education. The costs of private education are variable and largely unregulated. The Ministry of Higher Education (MoHE) is responsible for the administration of higher education, including funding, policy development, institution establishment, quality assurance, and advanced teacher education. Afghanistan’s 2010-2014 National higher education strategic plan tasked the MoHE with establishing an agency to oversee the accreditation of all public and private institutions of higher education. The MoHE has historically exerted a high degree of control over both the administrative and academic aspects of public universities. Post-Taliban reform efforts have sought to provide institutions with a greater degree of autonomy, but the effort remains incomplete. Enrollment in higher education in Afghanistan has expanded dramatically since 2001, with growth taking off in 2009 as the first cohorts of students to attend primary and secondary education post-Taliban reached university age. According to the World Bank, enrollments in Afghani institutions of higher education “increased from less than 8,000 in 2001 to about 152,000 in 2012.” (U.S. AID notes that enrollments had grown to 174,425 as of 2015.) Public institutions account for the lion’s share of volume. Their enrollments grew from roughly 8,000 in 2001 to about 100,000 in 2012. The prevalence of underqualified faculty are well recognized both within Afghanistan, and by the many international aid organizations focused on improving the sector. Almost all research-based recommendations focused on improvements identify a short term goal of increasing the percentage of faculty with master’s degrees, and a longer term goal of increasing the percentage with PhDs. The World Bank reported that as of 2013, most of Afghanistan’s public institutions of higher education had, at best, only one or two PhD-level faculty members. The overall rate was five percent. In the public sector, just three universities host the bulk of PhD-trained faculty or staff: Kabul University, Kabul Polytechnic University, and Nangrahar University. Fifty-seven percent of all instructors at the time held only a bachelor’s degree; the remainder, 38 percent, held a master’s degree. As the British Council noted in another 2013 report, one key quality-related challenge in the higher education sector is faculty pay. As Dr. C. Michael Smith, president of the American University of Afghanistan, told researchers. “People are forced to work on low salaries. In Kabul, for example, professors are forced to moonlight by teaching at private institutions in order to supplement their salaries.” The British Council Report notes one other issue that has quality implications, especially in the public higher education sector: Academic appointments have historically been awarded on the basis of political patronage, not academic merit. Primary education runs from grades 1 to 6. Children typically begin school between the ages of six and eight. The primary curriculum is consistent nationwide; however, teachers can tailor it to the local content. Primary education is is divided into two cycles. The first cycle covers grades 1 to 3, and the curriculum includes subjects such as religious studies, first language (Dari or Pashtu, depending on the region), mathematics, arts, and physical education. The second cycle includes grades 4 to 6. The curriculum covers the same subjects as the first cycle, plus additional subjects such as natural sciences, history, geography, and a secondary language (Dari or Pashtu, depending on the region). At the end of grade 6, students must pass an examination to gain admission to lower secondary education [Maktabeh Motevasteh]. At this point, they may opt to pursue a religious studies track, or a more general education track. The vast majority of students pursue the latter. Secondary education includes two three-year cycles. The first cycle, from grades 7 to 9, is referred to as lower secondary education, and the second cycle, from grades 10 to 12, is referred as higher secondary education. The curriculum of the first cycle includes subjects such as religious studies, local languages, mathematics, natural sciences, social studies, foreign languages (English, German, French and Russian), and physical education. Students who pass the examination at the end of grade 9 can continue to higher secondary education. (Upon completion of grade 9, students may opt to pursue technical and secondary vocational education, rather than higher secondary education.) The curriculum of higher secondary education is determined by whether the students choose to focus on natural sciences steam or social studies stream, although the subjects taken are largely the same, and duplicate most of the subjects taken in lower secondary education. No matter which streams the students take, they need to pass the graduation exam to be awarded the 12th grade graduation certificate. Technical and secondary vocational education programs offer an alternative to higher secondary education. The duration of technical programs ranges from two years to five years, depending on the field of specialization and a student’s entry level. regardless of how students enter, the program is considered complete at grade 14. Students are awarded the Vocational Education Certificate following completion of the program. Admission to public higher education institutions depends on students’ performance on the national university entrance examination, the Kankor Exam. Private higher education institutes do not typically require that students take the exam. As in the U.S. higher education system, first-year students at the bachelor’s level pursue one year of general education before selecting a field of study or major. The duration of study and required coursework vary by major. For instance, a bachelor of arts or science usually requires four years of full-time study. Programs in engineering, pharmacy, and veterinary medicine last five years. Students can begin medical degrees at the undergraduate level. Medical programs typically last seven years, and include a first year and a final-year internship. (Students may place out of the first year based on their Kankor results.) Graduates from medical programs are awarded a Medical Doctor (MD) degree. Students who complete their bachelor’s degrees are eligible for masters’ level study. However, very few master’s programs currently exist. Most are in teaching and engineering, and most are offered at private institutions, although a handful of public institutions have also begun to offer master’s programs. Collaborations with universities around the globe, including institutions in Sweden, Germany, the U.S., and the U.K. have helped to kick-start this segment of the the higher education sector. PhD programs are almost non-existent in Afghanistan. Nangarhar University, a public institution located in Jalalabad, launched the country’s first ever PhD program in the fall of 2014. Others are under development. Higher educational institutions in Afghanistan use a 100-point grading scale. Scores below 40 are considered failing. (Upper secondary institutions employ the same scale.) The European Credit Transfer and Accumulation System (ECTS) is used by some private higher education institutions. As of 2015, NUFFIC reported that the ECTS had not yet been officially adopted by Afghanistan’s Ministry of Higher Education. Afghanistan’s National Higher Education Strategic Plan 2010-2014 stipulates that all public and private higher education institutions are subject to accreditation. All institutions are required at a minimum to be candidates for accreditation within two years. First, an institution must show that it meets minimum requirements (e.g., registration with the Ministry of Higher Education) and undertake a self-assessment process. The next step is peer review. Upon passing peer review, the institution receives accreditation level one status. Level one status lasts one year, at which point an institution enters level two. During this year, it conducts another self-assessment, and undergoes additional peer review. A positive recommendation from peer reviewers to the Council of the Accrediting Agency triggers full accreditation, which is valid for 5 years. The report goes on to note that, in some cases, to address capacity issues, the MoHE has outsourced the responsibility for accreditation to public universities such as the University of Kabul. The process has not always been smooth: Private institutions routed through their public counterparts for accreditation charge that public university oversight is overly restrictive, and limits academic freedom and rigor. Other (presumably lower quality) private institutions have simply opened up without recognition or authorization. Teacher training is the responsibility of both the Ministry of Education and the Ministry of Higher Education. Oversight depends on the level at which educators will ultimately teach. Teacher training for those at the primary or lower secondary level is overseen by the MoE. Teacher training for those at the higher secondary level or above is overseen by the MoHE. Teacher training at all levels is lacking. At both the primary and upper and lower secondary levels, official requirements for teacher qualifications are rarely met, and many practicing teachers, especially in rural provinces and districts, have no formal training and have only completed primary or secondary school. At the higher education level, the number of PhD-level faculty is glancing low, and more than half of all instructors hold only a bachelor’s degree. The Teacher Training Department within the MoE oversees teacher training colleges (TTCs) in Afghanistan’s 34 provinces, as well as dozens of “satellite” TTCs throughout Afghanistan’s far-flung districts. Teachers of basic education (grades 1 to 9) are required to possess TTC diplomas, although many do not. In an effort to enforce compliance with the requirement, the MoE issued a 2009 degree requiring that provinces replace non TTC-trained teachers with TTC graduates. International aid organizations and the MoE have also sought to launch a range of informal teacher training programs that reach regional teachers already in the field. Teacher training colleges offer a range of training options aimed at new and practicing teachers: five-year pre-service, two-year pre-service, and in-service. The latter seek to raise the qualification level of teachers already in the field. Among pre-service teacher trainees, coursework requirements are different depending on the level of education obtained prior to admission to the TTC. Lower secondary (grade 9) graduates must complete five years of coursework in order to teach; upper secondary graduates (grade 12) can complete the coursework in two years. Teachers of higher secondary education (Grades 10 to 12) are required to hold a bachelor’s degree from a university or higher education institute. The training period at both universities and higher education institutes is four years. As of September 2016, WES does not verify academic documents from Afghanistan. This policy is currently under review, given significant efforts to reconstruct and reform the secondary and the higher education systems, and efforts to ensure the availability high-quality, verifiable documents. That said, the lack of verifiable academic documents is a known challenge at both the national and international levels. In fact, the effort to ensure that students obtain high quality proof of studies is a priority both for upper-level Afghanistan government officials, and international NGOs seeking to aid reconstruction of the country’s education system. In 2016, the U.S. Senior Inspector General for Afghanistan Reconstruction reported an NGO tasked with providing remediation to government agencies or ministries struggling to staunch corruption. The NGO, Afghanistan Electoral Reform and Civic Advocacy (AERCA), recently highlighted challenges with verifiable academic documents (e.g., the “issuance of diplomas and transcripts by the Ministry of Higher Education” and “high-school diploma issuance by the Ministry of Education”) as a top-10 priority. This file of Sample Documents (pdf) shows a set of credentials from the Afghanistan education system. These credentials are provided by NUFFIC. The total number was estimated by adding up the count in “Destination country” table, instead of using the total number of “mobile students abroad” (12,003) shown in the “Key Indicators” table. The number of students who reportedly went to Iran, India, Turkey, Saudi Arabia and the U.S. exceeds that estimate of 12,003 by almost 5,000. These are not short-cycle higher education institutions along the lines of U.S. community colleges, but full degree awarding institutions. They could be classified as universities, although they use the title Institute rather than University. As with all statistics out of Afghanistan, the numbers are hard to pin down. The World Bank estimated 50,000 as of 2012.